In this example, you will in depth about C program to convert roman number into decimal number with proper explanation. Repeating a roman numeral up to three times represents the addition of the number whereas, V, L, and D cannot be repeated. If roman numbers are in decreasing order from left to right it represents an addition of the numbers. Writing the smaller number to the left of the larger number in the Roman system represents subtraction. You will need to have sound knowledge of following articles for proper understanding. Now, let’s write C code to convert the roman number into the decimal number using above rules. In the above program, we have included string.h library to use standard string library function strlen that is used to determine the length of the roman number. while function is used to access every digit in the Roman number that is stored in the character array romanNumber. The program first checks for the validity of the roman number entered by the user using two consecutive if conditions as discussed in the rule above. 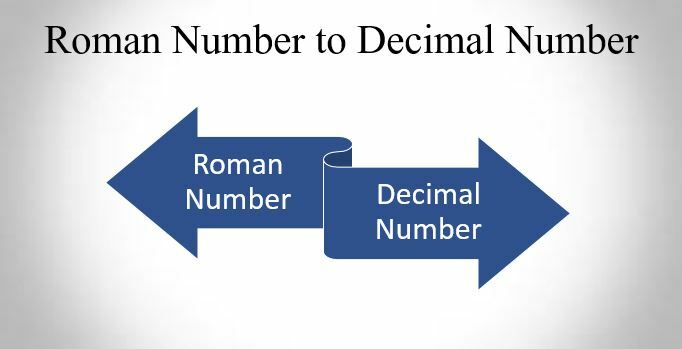 If the entered roman number is valid then only third if condition computes the equivalent decimal number.